MagneticTime announced their MT1 software that lets you listen to your emails and Word docs on iPods, Cellphones, PDAs & PCs in MP3 format. 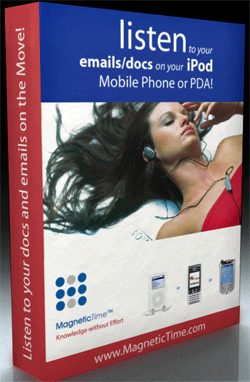 MagneticTime’s MT1 allows you to listen to your Outlook, Outlook Express & Word documents like 'songs,' since they are automatically converted to MP3 files on your iPod, cellphone, PDA or PC. I couldn't determine whose Text-To-Speech (TTS) algorithm they use when I checked out their website. MT1 automatically creates a new Outlook folder. Once a new email arrives in your inbox, it’s automatically selected & copied to that folder, where it awaits processing and translation to audio. This process is automatic. MT1 also allows you to listen to emails with Word document attachments. When you’re ready to listen to your emails on your iPod, cellphone or PDA, simply connect that device to your PC and press the download button. You’re now ready to listen to your emails. Seems like a great ides for busy business executives or gadget fans that want to have the latest cool gadget. So if you are overwhelmed by email and Word documents simply convert them to audio, take them to the gym and play them over your iPod or even on your car radio - assuming you have an iPod FM transmitter.